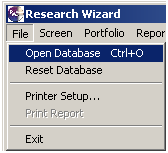 Did you know you can create and scan for Moving Averages with the Research Wizard? Moving Averages and Increasing (or Decreasing) Volume and etc. Moving averages are great in helping to determine if a market (stock) is in an uptrend or downtrend and if a trend change is/has taken place. Moving averages act as trendlines (albeit moving and curved) in that as the stock trades above the moving average, it's bullish whereas if it trades below it, it's bearish. Short-term moving averages help gauge the short-term direction of the market while longer-moving averages take a bigger picture view. The 10 day moving average is just that; the average of the last 10 days of prices. Each day the average price changes as the most recent day's price is included and the oldest price drops off. As the stock's price increases, the moving average's price increase as well. If the stock's price decreases, the moving average price will also decrease. An example of an intermediate-term moving average would be a 50 day (or ten week) moving average. Once again, the most recent day's price is included while the oldest price is no longer included. Of course, one day's price out of a possible 10 days of prices will have a greater influence on the moving average price than one day out of 50 days of prices. So the shorter the number of days included in the moving average, the more sensitive it's considered. A longer-term moving average example would be the 200 day (or forty week) moving average. As long as the stock trades above it, the longer-term trend is considered intact. If a stock breaks the 200 day moving average on its way down, that's generally thought to be bearish, and the longer-term trend could be reversing. It'll take more price action over a longer period of time to influence this moving average. Just like trendlines, moving averages can act as support and resistance. If a stock comes down, but stops at or around the moving average and then starts moving higher from there, it can act as a firm underpinning of support for the stock. If a stock is trading below the moving average and rises up to the underside of it but is turned away and goes lower, the moving average has acted as upside resistance. Note: Moving Averages are less exacting than trendlines when acting as support and resistance. And shorter-term moving averages are not as robust as longer-termmovingaverages in this regard. Although it should be noted too that shorter-term trendlines are also not as robust as longer-term trendlines either. 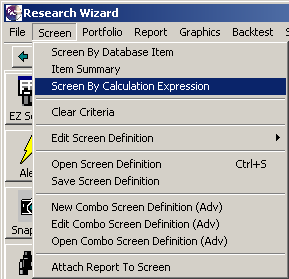 To build a moving average in the Research Wizard, we'll do this in the Calculation Expression feature. In this example: let's screen for stocks trading above their 200 day moving average. 1. 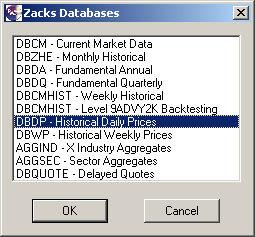 First, let's switch to our DBDP (Historical Daily Prices) database by going to File on the Menu Bar and selecting Open Database. 2. 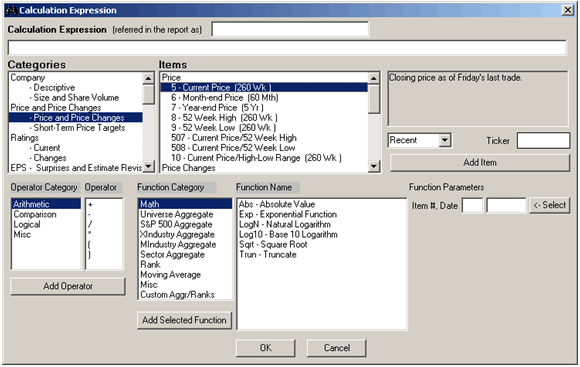 Then select the DBDP - Historical Daily Prices database and click OK.
7. Then, making sure that Daily Prices is still highlighted in the Items window, go to the Function Parameters section and click on the 'Select' button. (You'll see the two boxes populate with 6 (meaning item # 6) and Recent. 8. Next, in the Function Category window, highlight Moving Average. Then in the Function Name window, highlight Moving Mean. Then in the Number of Periods box, type in 200 as shown below. (That means 200 days.) And then click the Add Selected Function button. The long dialogue box will read: i6 > MovingMean200(i6) as shown below. 9. Click the OK button at the bottom to complete the Calculation Expression. 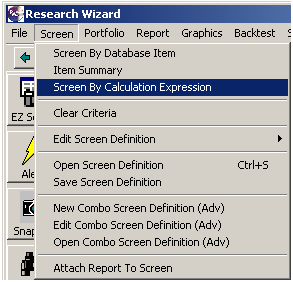 If done correctly, the Screen Definition table and the Report Definition table will look like the image below. 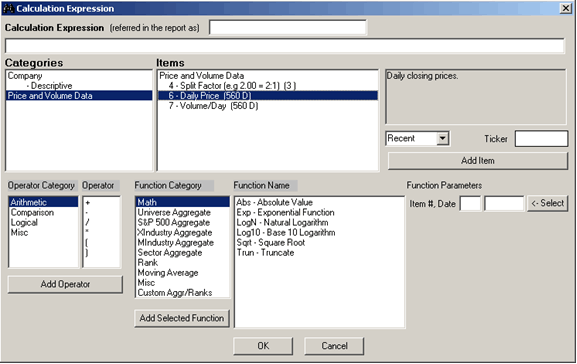 Click the Run Query button and only stocks trading above their 200 day moving average will come thru. From the report page, select a ticker by left clicking it once, then right clicking it so a Menu pops up (as shown below). When you're done looking at the stocks, make sure to go back and save your screen if you don't wan to lose it. You can also screen for moving average crossovers too. In the previous example, we went step by step in screening for stocks where the current price was greater than the 200 day moving average. 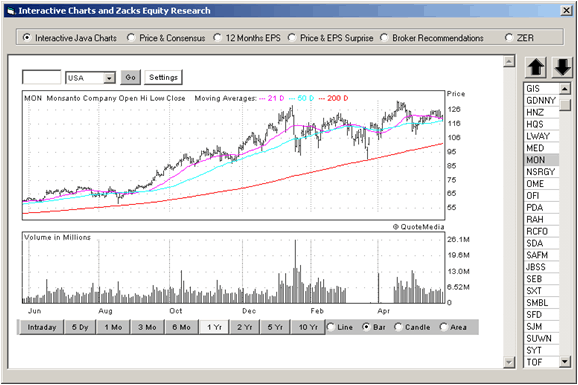 In this next example, let's look for stocks where the 50 day moving average is greater than the 200 day moving average. First, clear out your criteria by clicking on the Garbage Can button on your Tool Bar. Then repeat step 1 thru 3 as described above. 5. Then, go to the Function Parameters section and click on the 'Select' button. (You'll see the two boxes populate with 6 (meaning item # 6) and Recent. The long dialogue box will read: MovingMean50(i6) as shown below. The long dialogue box will read: MovingMean50(i6) > MovingMean200(i6) as shown below. Click the Run Query button and only stocks whose 50 day moving average is above their 200 day moving average will come thru. 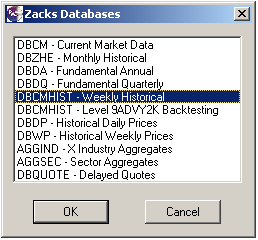 If you want to backtest a screen with moving averages, be sure you create your moving average in the DBCMHIST database. The moving average screens we just created in the DBDP database (Historical Daily Prices database), cannot be backtested. But if you create the moving average in the Weekly Historical Database (DBCMHIST) it can be. In this example, let's look for stocks where the 50 day (or 10 week) moving average is greater than the 200 day (or 40 week) moving average. 1. First, let's switch to our DBCMHIST (Weekly Historical) database by going to File on the Menu Bar and selecting Open Database. 2. Then select the DBCMHIST - Weekly Historical Database and click OK.
5. Then, go to the Function Parameters section and click on the 'Select' button. (You'll see the two boxes populate with 5 (meaning item # 5) and Recent. The long dialogue box will read: MovingMean10(i5) as shown below. The long dialogue box will read: MovingMean10(i5) > MovingMean40(i5) as shown below. Click the Run Query button and only those stocks whose 10 week moving average is above their 40 week moving average will come thru. For shorter-term moving averages, you would do it the same way, but change the Numbers of Periods box to 4 for weeks (or the approximate equivalent of 20 days) or 2 for two weeks (or the approximate equivalent of 10 days). 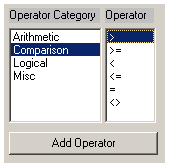 To add more items to this screen, simply return to the main DBCM database and continue to build upon this screen. Go to File, Open Database and select Reset Database. This will take you back to the default DBCM database where you can finish the rest of your screen. Then be sure to save your screen if you want to use it for later or if you want to backtest it. To backtest this screen, simply backtest it like you would any other screen. Using a screener to find and test different moving averages can be quick and easy and potentially profitable. Of course, moving averages alone don't tell the whole story. But a company with solid fundamentals, while also trading above these trend indicators, can help you find winning stocks. And they can also alert you to trend changes too.